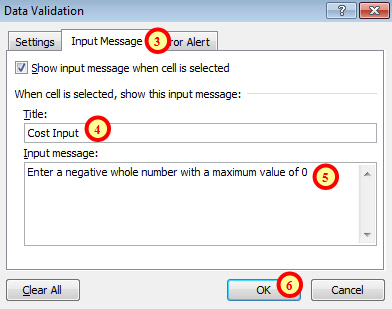 Input messages and error alerts give your users more information about what values are allowed to be entered into your validated cells. Before you can add either of these things you'll need to select the cells you have previously validated. Select any cell that contains the validation settings you want to change. The Go To dialog box allows you to jump to specific cells in the spreadsheet. Here we need to click the Special... button. This dialog box allows you to select individual components of cells. The numbered steps are described below. 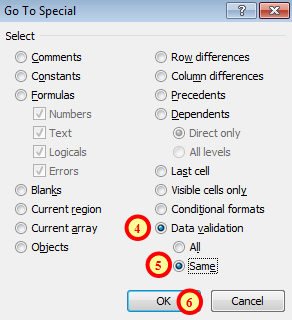 To select cells with the same validation settings as the one you have selected choose Same. Click OK to select the validated cells. Now that we have the validated cells selected we can edit the validation settings. Select the cells to which you want to add an input message. Use this tab of the dialog box to create an input message. Select the Input Message tab and make sure the Show input message checkbox is checked. Enter a title for the message here. Enter the text of the message here. Click OK to create your input message. You'll be able to see your input message whenever you select one of your validated cells. Input messages appear near to the selected cell. 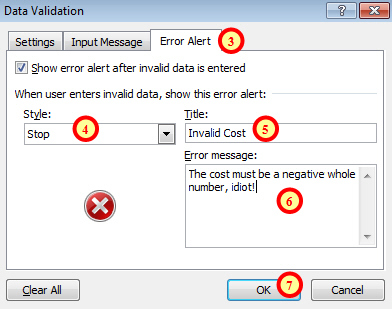 Select the cells to which you want to add the error alert. Use this tab of the dialog box to add an error alert. Select the Error Alert tab and make sure the Show error alert checkbox is checked. Choose a style of error message (more on this below). Enter a title for the error message here. Enter the text for the message here (you can type in rude words but we've managed to resist doing that here). Click OK to create your error alert. Stop - This style prevents you from continuing with the invalid data entry. You can either click Retry to try again with a new value or Cancel to reset the cell to its original value. Warning - Use this style of message to warn users of values that are outside of the normal range but not beyond the realms of possibility. You can click Yes to continue and enter the value in the cell. Information - Use this style of message to inform users of the effects of entering a particular range of values. With this style of message simply click OK to continue with the value entered. 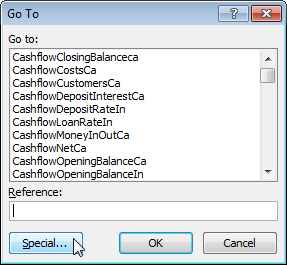 From the Data tab of the ribbon select the option shown here. Any invalid data on the current sheet will immediately be highlighted with red circles. Without the red circles this type of input error can be tricky to spot. Choose this option on the Data tab of the ribbon to remove the red circles. Select the cells you want to remove validation from. You can clear validation settings using the same dialog box you used to apply them. 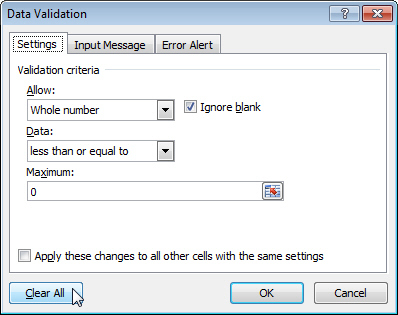 On any tab of the dialog box click the Clear All button to remove all validation settings from the selected cells. Annoyingly, it's very easy to accidentally remove validation settings from a cell. If you copy a non-validated cell and paste onto one that has been validated you will inadvertently remove any validation settings that you had applied. The final technique that we'll look at with data validation is how to create a cell drop down list to allow users to select a value rather than having to type it in. Read the final part of this series to find out how to do this, or have a look at the classroom Excel courses that we offer.